Memory lapses are a very common occurrence among people of all ages. However, when people notice an increase in their frequency or their severity, it can be distressing, trigger fears of “losing it” or taken as the first sign of a serious neurological condition (like Alzheimer's disease). Fortunately, this is not always the case, because memory lapses are frequently caused by treatable conditions like nutritional deficiencies or hormonal imbalances. Please, continue reading to learn more about the causes, risk factors, signs and symptoms, prevention, and treatment options for memory lapses. Almost everyone will experience memory lapses at some point. Pregnant women often report a marked difficulty in remembering pending tasks, a type of memory lapse jokingly known as “mommy brain”. 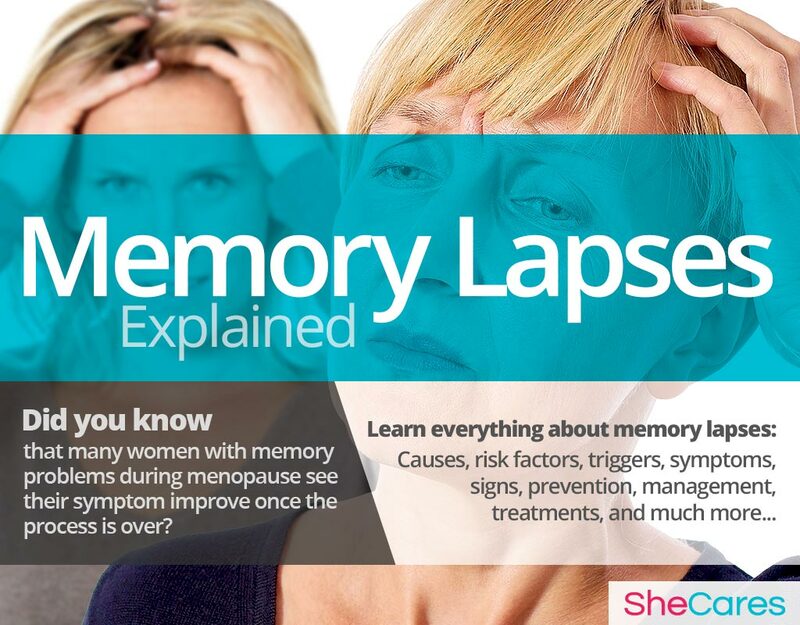 Many women with memory problems during menopause see their symptom improve once the process is over. Only 13% of people over 65 will develop a serious dementia. Memory lapses are defined as a momentary inability to retrieve a particular piece of information from one's memory. This can include a face, a name, a phone number or a particular word. The “lapse” itself can last only a few seconds or a couple of minutes, after which the memory will come back, but the feelings of anxiety and frustration they provoke may last longer. While a certain amount of memory problems are common and regarded as a normal part of aging, women are more prone to experience them more frequently when undergoing phases of hormonal transition, such as puberty, pregnancy, post-partum, nursing and menopause. However, when a woman starts noticing their memory lapses are happening more and more often, she may be concerned about developing a more serious condition such as dementia or even Alzheimer's disease. While this is most likely not the case, it can nonetheless cause a great deal of distress to a woman's life and perception of wellness and self-sufficiency. While memory lapses themselves do not have any correlation to or effect on a woman's fertility, when they appear on a woman on reproductive age they may reveal a hormonal imbalance which could influence many other aspects of a woman's life, including fertility. 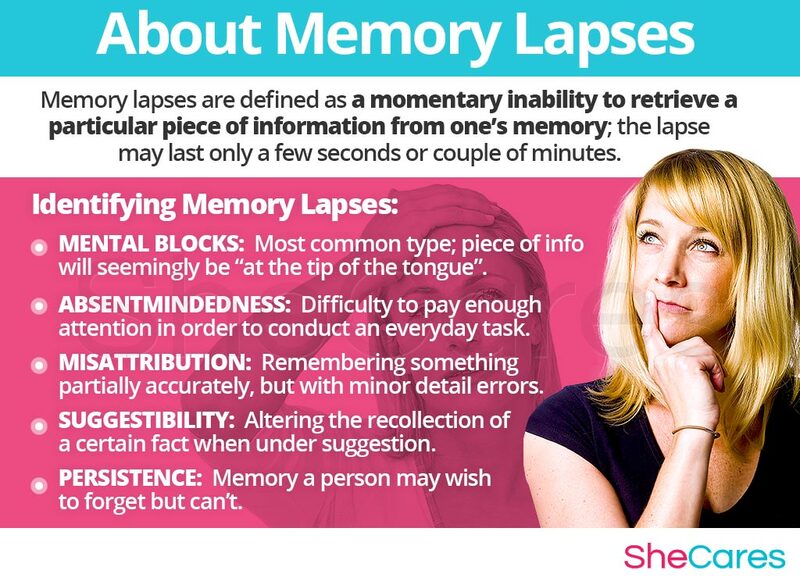 There are different types of memory lapses, and while some women will experience only one of these types on very rare occasions, others will present mostly a type or two but may, when under particular duress, present other subtypes. The different types of memory lapses are mostly identifiable by the type of information that can't be recollected and the duration of time it can't be recollected for. In order to understand the processes behind memory lapses, continue on to the next section to read about their hormonal and non-hormonal causes. To combat memory loss caused by aging, it can be helpful to exercise both your body and your brain. Physical workouts make your brain better at retaining information, and using your brain for things like reading a novel, solving a puzzle, or learning a new language can help improve mental functioning as well. Loss of estrogen during menopause may cause cognitive deterioration (sometimes experienced as memory lapses), which can be even more severe as a result of surgically induced menopause. Learning about the cause of memory lapses provides the key to understanding how to prevent and treat these troublesome attacks. 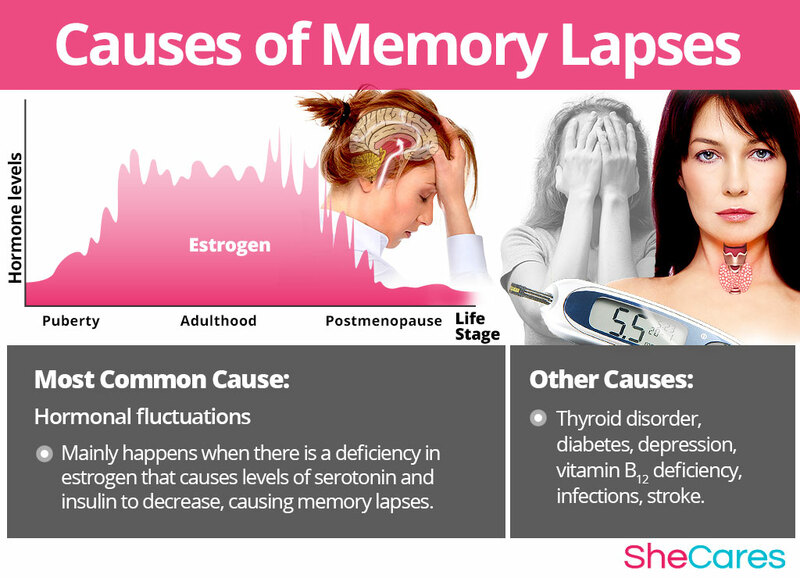 While the exact causes of memory lapses are complex and not yet completely understood, most doctors and researchers believe hormonal changes are the primary cause of memory lapses. In addition to these completely normal hormonal causes, other factors and medical conditions can, in more rare instances, cause memory lapses. Continue reading to learn more about both the hormonal, and other, causes of memory lapses. Hormones are chemical messengers that control every organ and biological process in the body. When changes between these hormone levels occur, organs don't receive the correct signals to function adequately, and hormonal disorders arise. Extensive medical research has found a strong link between levels of hormones estrogen and progesterone and the production of serotonin. This is a neurotransmitter - or brain regulating hormone - known as one of the “feel-good” chemicals, and it is regarded as essential to proper brain function. While mostly notable for its mood-enhancing properties, serotonin also regulates appetite, sleep, sexual desire and memory. Furthermore, estrogen is linked to production and regulation of insulin, which in turn helps process sugar and regulates the amount of glucose present in your blood stream at any given moment. Because the brain feeds off exclusively of sugar in order to function, any fluctuations in the amount of blood sugar may lead to bouts of hypoglycemia, which produces restlessness, fuzzy thinking and memory lapses. A deficiency in estrogen at certain points in the menstrual cycle and during phases of significant hormonal imbalance - puberty, pregnancy, post-partum, and menopause - causes levels of serotonin and insulin to decrease, and consequently results in memory lapses. In this sense, we can say that memory lapses are largely caused by the hormonal fluctuations during the changes women go through during their reproductive life. Furthermore, there are also specific hormonal causes and typical environmental factors which can explain the occurrence of memory lapses according to the stage of a women's reproductive life in which this disorder appears, such as around PMS and during puberty, pregnancy, post-partum, and menopause. PMS is a consequence of hormonal fluctuations linked to the menstrual cycle. It is a collection of disorders, which may include memory lapses, among others. Puberty is the stage in which a girl's body begins to produce reproductive hormones; these and other factors, such as parental pressures and poor nutrition, contribute to memory problems during puberty. Pregnancy leads to extreme changes in the production of reproductive hormones, which along with other factors, like fatigue or bodily changes, can lead to memory lapses. Postpartum and breastfeeding is another stage where reproductive hormones are imbalanced, leading to symptoms like memory lapses. Also, other factors contribute to memory lapses in postpartum, like stress and lifestyle influences. Menopause is the stage in a woman's life when production of reproductive hormones naturally declines, signaling the end of a woman's fertility. As well as hormonal causes, other factors add to the reasons for memory lapses during menopause, including the experience of other symptoms of menopause. While hormonal imbalance is the major underlying cause of memory lapses during a woman's life, experts also point out that cognitive disturbance may be caused by other, less common, underlying conditions, including thyroid disorders, diabetes, and as a symptoms of certain nutritional deficiencies. 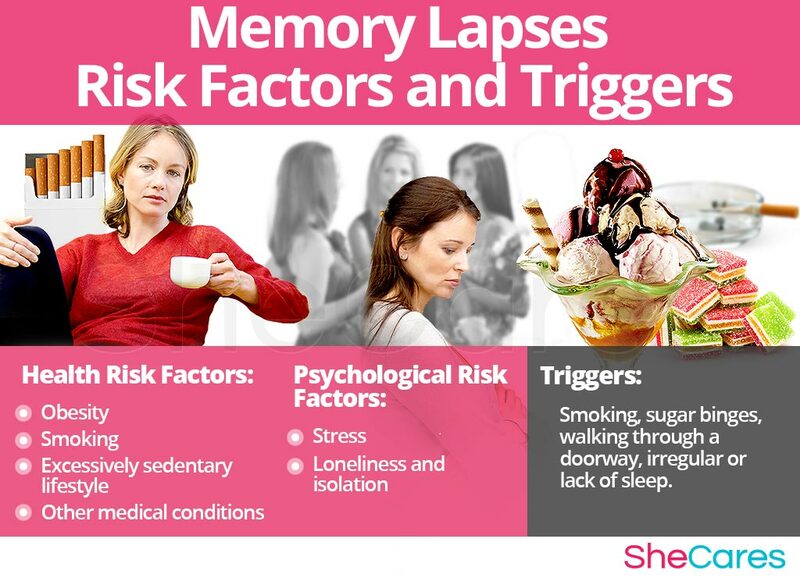 Keep reading to learn what these risk factors and triggers are, and how they have such a profound impact on a woman's experience of memory lapses. Some women are more likely than others to suffer from memory lapses for inherent psychological, behavioral and health reasons. These predisposing factors can affect a woman's hormone levels and increase the chances that a woman will develop memory lapses during her reproductive life. In addition to long-term risk factors, memory lapses can also be triggered by certain environmental phenomena and behavioral habits. Avoiding these environments or habits as much as possible may help to avoid the onset of memory-related symptoms. These include habits like smoking or having frequent sugar binges, or normal day to day activities like walking through a door. In order to properly identify all possible triggers for memory lapses, it is important to identify the disorder properly. Continue reading to discover the symptoms and signs of memory lapses to be able to choose a treatment specific to its cause. Memory loss is not just a problem for aging adults. Young adults can be affected as well, but it is not necessarily a cause for extreme concern. Many causes of memory loss - like lack of sleep and stress - can be ameliorated with just a few lifestyle changes to help manage the symptoms. Because each woman has her own way of experiencing memory lapses and of assessing the impact they have on her daily life, the individual experience of them will be different for each woman. 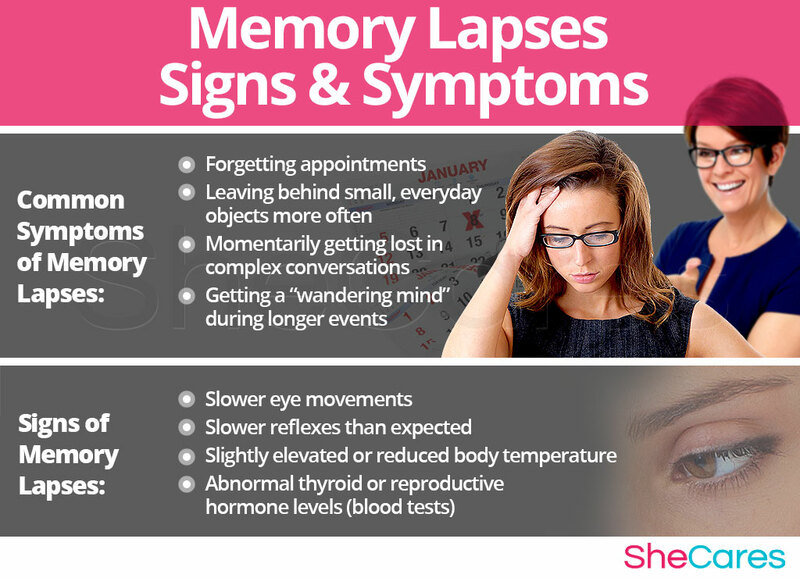 Many symptoms listed below are part of short-term memory loss and are common for women going through a phase of hormonal imbalance. Making some every-day decisions begins appearing slightly more difficult. To diagnose and identify the symptoms of memory lapses, a doctor must typically perform four procedures. First, they should review the patient's medical history; then, they should conduct a physical exam, followed by a neurological evaluation. The doctor may order additional tests, if necessary. In rare cases, severe memory lapses that seem to progressively worsen rapidly or long term memory loss may be a sign of more serious conditions that can be risky for a woman's emotional and physical health if left untreated. However, it is important to remember that in most cases, memory lapses will not require any serious medical intervention. These possible, but uncommon, complications of memory lapses can include Alzheimer's and dementia, and they have some specific warning signs. Women who experience severe and frequent mood swings may wish to treat or even prevent them. Keep reading below to learn about how to prevent and manage mood swings. 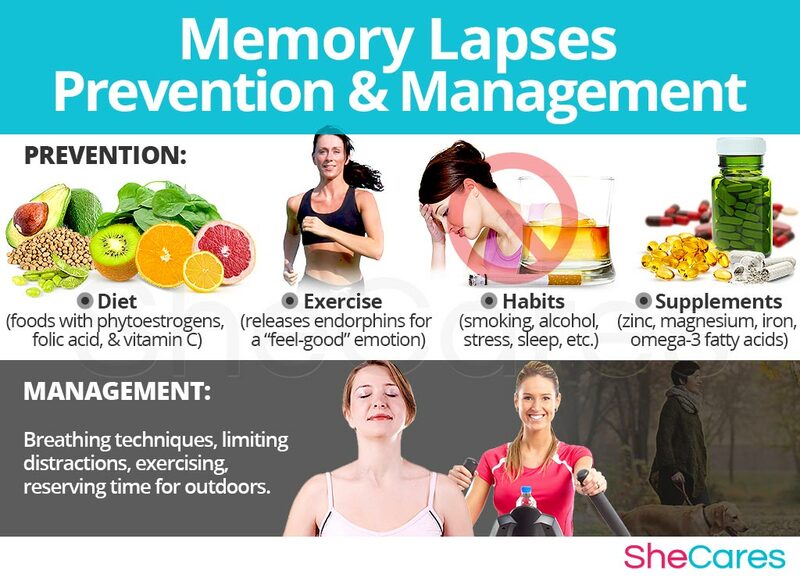 While there is no single way to completely prevent memory lapses, just as there is no way to stave off natural hormonal process, there are a few steps that a woman can take to lessen her chances of developing problems with her memory or cognitive ability, or to minimize the impact or length of time that symptoms occur. In this sense, lifestyle changes for prevention are extremely important, especially with regard to diet, exercise, and healthy habits. Moreover, a woman may seek ways to complement these lifestyle approaches with the use of supplements that help enhance the endocrine system and, therefore, help prevent or ease the symptoms of hormonal imbalance such as memory lapses. For women who are already going through the disorder, prevention may not be possible if memory lapses have already appeared. Fortunately, there are many ways to manage them in order to prevent the “flare-ups” or lessen the intensity of the symptoms. Keep reading to learn about the different ways to manage memory lapses. Wherever you happen to be when experiencing a mental blockage, or if you recognize that memory lapses are happening more often or regarding more serious information, there are effective ways to instantly manage your cognitive ability. Making minor daily changes and avoiding triggers can make a huge difference for women who are trying to manage memory lapses. There are certain tips and tricks available that can help improve the experience of memory lapses, giving women the tools they need to cope with them. There are general tips that women of all ages can use, such as breathing exercises or mnemonic techniques. While these measures often help to reduce the frequency and intensity of memory lapses, they are unable to treat the root of the problem, which is hormonal imbalance. However, there are several natural treatments that can treat the hormonal causes of memory lapses. Please continue to the next section to learn more about treating memory lapses. Keep reading to discover treatment approaches for memory lapses. Memory lapses can be frustrating, difficult to admit, and potentially detrimental to a woman's performance at work or at school. For women who are going through a phase of hormonal imbalance, memory lapses and cognitive problems are normal up to a certain point, although in some cases the symptoms can become severe and interfere with daily life. Luckily, it is more than possible to find and effective treatment for memory lapses. Three levels of approaches can be considered for treating memory lapses. These are categorized as: (1) Lifestyle Changes, (2) Alternative Medicine and (3) Pharmaceutical Options. Women are encouraged to begin with the least risky approach to memory lapses treatment, lifestyle adjustments. While they are so often effective at curbing the disorder, these alone do little to address the most common cause of memory lapses in women - hormonal imbalance. Fortunately, alternative medicine can be combined with lifestyle changes to provide a safe and effective treatment for memory lapses. While medical intervention is not usually considered necessary to treat memory lapses, some women may wish to consider drug options if they are unable to find relief from natural treatments. For women considering this option, it is important to understand, and carefully weigh up, the risks associated with the treatments for cognitive problems. This primary level of treatment involves the least amount of risk though conversely it requires the highest amount of self discipline. Often simple changes in lifestyle can reap huge benefits in fighting memory lapses, and achieving a higher overall level of health. Fundamentally, an improved diet, regular exercise, and healthy habits can do a woman great service. 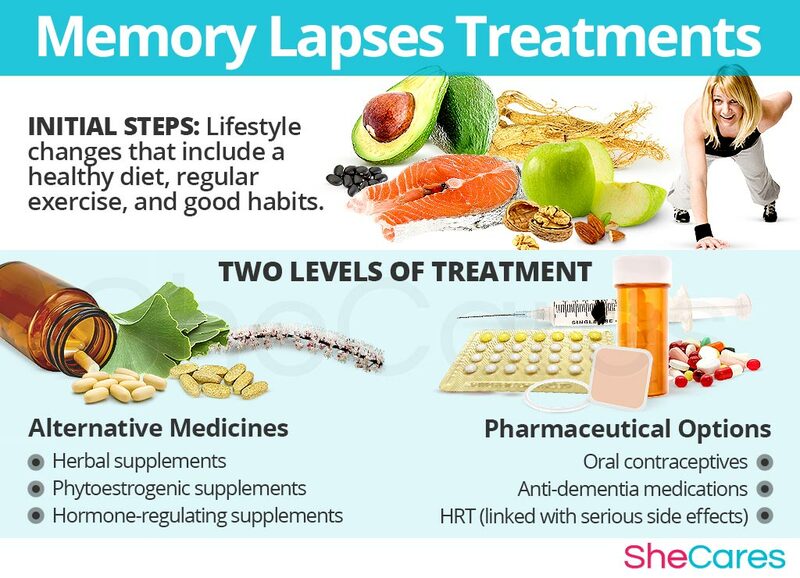 While these changes will help alleviate memory lapses, they do not directly address hormonal imbalance - the most common cause of memory lapses, and so further treatment may be necessary. Alternative medicine has proven to be an excellent way of treating memory lapses related to hormonal imbalance in a safe and natural way. Alternative medicines and supplements involve little to no risk and can be an extremely effective way to treat memory lapses. This level of approach can involve several different options. In the case of herbal supplements, there are two main types of herbs that can be used: phytoestrogenic herbs and hormone-regulating herbal supplements. These supplements, such as black cohosh or gingko biloba, contain estrogenic components produced by plants that complement the low estrogen hormones in a woman's body, helping alleviate memory lapses. By introducing plant-based estrogens into the body, these herbs treat the underlying estrogen deficiency behind memory lapses. These supplements can be considered the safest and most natural way to treat the underlying hormonal imbalance behind memory lapses, and can be taken throughout a woman's life, as they support the body's natural hormone production. A combination of approaches is usually the most effective route to take. Lifestyle changes combined with alternative medicine will most likely be the best way to alleviate the symptoms of memory lapses. However, for some women the symptoms will be so severe that a more drastic treatment is necessary. Interventions at the third level involve the highest risk and often the highest costs. Not all treatments are suitable for women at every life stage, so it is strongly recommended to speak to a licensed healthcare practitioner before starting any pharmaceutical treatments for memory lapses. There are two main types of pharmaceutical options that can be prescribed to treat memory lapses: hormone-regulating medication and anti-dementia medication. These three approaches are not mutually exclusive. A woman may use different approaches at different times or any combination of them, depending on the duration and severity of symptoms. Today more and more women find that dealing with symptoms related to hormonal imbalance is best accomplished via a combination of healthy lifestyle and alternative treatments.